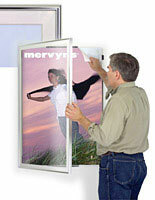 These Picture Frames Have A Swing-Door Front And Low Profile! 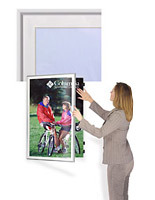 These Picture Frames Display 24" x 36" Graphics And Include A White Matboard! 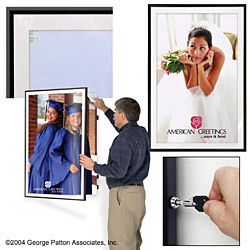 The outer dimensions of these picture frames are 26.5"w x 38.5"h x 1.5"d and the observable area is 23.375"w x 37.375"h. Mounting instructions and hardware are provided. 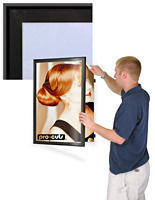 Click here to view how this frame mounts. 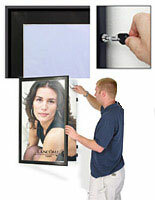 Post new media content, prints or artwork in less than a minute in these tamper resistant locking picture frames. Concealed hinges enable the 1/2" wide satin black aluminum framing to swing open giving you entrance to easily make changes. 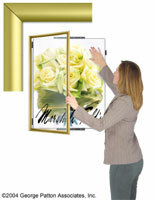 A plunge lock furnishes security when the frame is closed. View how the plunge lock works. Metal hinges fasten to an inner frame that mounts to the wall with the provided hardware and furnishes support when the outer frame swings open. 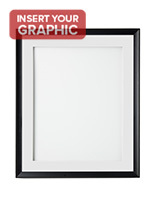 The outer frame contains a white matboard and a clear acrylic lens to shelter your prints. Prints up to 3/16" thick can be mounted to the supporting duraplast backboard utilizing the provided reusable/removable mounting tabs which make replacement a snap.